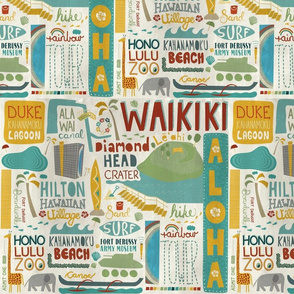 Designs in this series will feature beach and lagoon, with additional inspiration from Hilton's iconic Rainbow Tower and famous Diamond Head Crater. Add in some surfboards, palm trees, and/or canoe rides, to round out the best of what Hilton Hawaiian Village has to offer in the way of fun family-friendly outdoor activities. 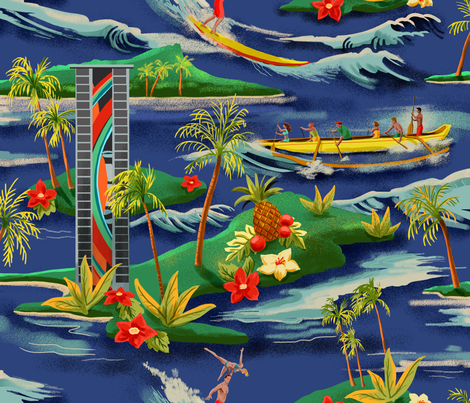 We’re packing our swimsuits, putting on the sunblock and saying Aloha to our friends in Hawaii for this month’s weekly design challenges! 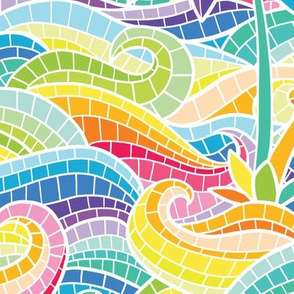 Throughout the entire month of June, enjoy design themes inspired by the serene surroundings of our design challenge partners, Hilton Hawaiian Village Waikiki Beach Resort. We are beyond excited to announce that with the generous support of the Hilton Hawaiian Village Waikiki Beach Resort, the grand prize winner will receive (2) five night stays (one for promotional use and one for vacation) at the Hilton Hawaiian Village and $1,000 towards your airfare! 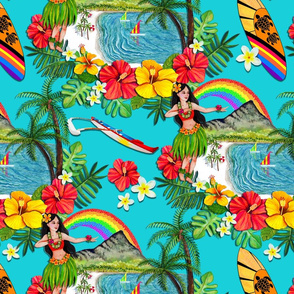 That’s right: your design challenge entry could lead you to the beautiful white sand beaches of Waikiki, where your only worry will be deciding whether you enjoy your tiki drink with or without a paper umbrella. Before you start packing, it’s time to start designing! 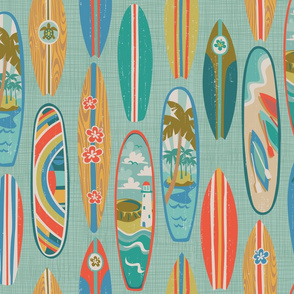 Read on to learn all about our Hawaiian inspired themes. 1 first place winner each week (4 total, 1 per theme), chosen from the top 25 by Hilton Hawaiian Village Waikiki Beach Resort, will be have their winning design manufactured as shirts for employees, in-lobby decorations, shirts for sale in the gift shop, and assorted other sundries and accessories. Winners will receive 10% commission for each yard of fabric purchased to manufacture these, along with a $200 Spoonflower credit. In addition, the grand prize winner will receive (2) 5-night stays at the Hilton Hawaiian Village Waikiki Beach Resort - (1) for promotional use (PR) and (1) for vacation. 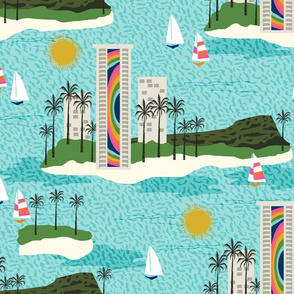 Spoonflower will award each grand prize winner $1,000 toward airfare for their PR stay. 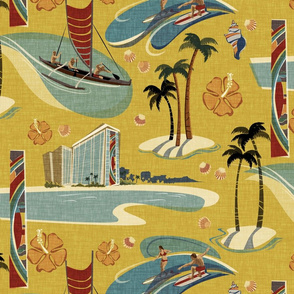 2nd place (4 total, 1 per theme) winner will receive a $100 Spoonflower credit. 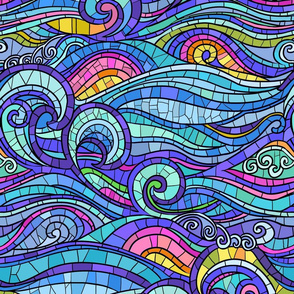 3rd place (4 total, 1 per theme) will receive a $50 Spoonflower credit. Remaining top 10 designs will receive a $20 Spoonflower credit. 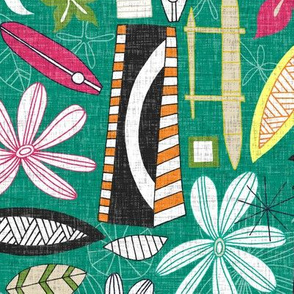 The top 25 popularly-voted designs from each theme (100 total, 25 per theme) will be automatically made available for sale in the Spoonflower Marketplace (provided they are a verified seller) where they will receive 10% commission on every sale -- no $5 swatch required. The deadline for entries is Tuesday, May 30, 2017 at 3 PM EDT. All designs will be eligible for public voting, and the popular vote determines the top 25 winning designs. The first place winner will be chosen by Hilton Hawaiian Village Waikiki Beach Resort from the popularly-voted top 25 designs.